In this Japanese name, the family name is Tomita. Tomita Tsunejirō, the Guardian of the Kōdōkan. 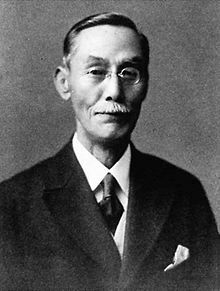 Tomita Tsunejirō (富田 常次郎, February 28, 1865 – January 13, 1937), born Yamada Tsunejirō (山田 常次郎), was the earliest disciple of judo. His name appears in the first line of the enrollment book of the Kōdōkan. Tomita, together with Saigō Shirō, became the first in the history of judo to be awarded the rank of Shodan by the founder of judo, Kanō Jigorō, who established the ranking system that is now commonly used in various martial arts around the world. Tomita was known as one of the "Four Kings" of Kōdōkan judo for his victorious efforts in competing against jujitsu schools. He was awarded 7th dan upon his death on January 13, 1937. As the earliest student at the Kodokan, Tomita was known as Tsunejiro Yamada. He was adopted by a family named Tomita and his name was therefore changed. He entered the Kodokan in June 1882 as an uchi deshi or live-in student at the recommendation of Jigoro Kano's father. He became Kano's usual training partner. Although he was the least physically gifted of Kano's earlier students, he was dedicated and strong-willed. Tomita had his first match on behalf of Kodokan in 1884, when three fighters of the Yoshin-ryu jujutsu school named Matsugoro Okuda, Daihachi Ichikawa and Morikichi Otake came to challenge their members. As Kano was out at the moment, they only found Tomita training with Shiro Saigo and Sakujiro Yokoyama, but those decided to answer the challenge by themselves. The three Kodokan members defeated their opponents in respective matches, with Tomita throwing his adversary via tomoe nage and choking him out with gyaku-juji-jime. Kano was not pleased with their behavior when he found out, thinking they had shown themselves too eager to fight, but anyway their victories helped to increase Kodokan's renown in Japan. In autumn of the same year, Tomita was challenged by Hansuke Nakamura of Ryoi Shinto-ryu during a Tenjin Shinyo-ryu dojo opening in which they were both guests. A police instructor and a man of large size, Nakamura was nicknamed the "Demon Slayer" and considered the toughest man in Japan. As he was much heavier and more experimented than Tomita, Nakamura dared him to fight, believing himself to be superior. However, as soon as the match started, Tomita immediately scored a tomoe nage, and he repeated the technique two more times before his still shocked opponent managed to block it. Nakamura further blocked an ouchi gari and attempted to counterattack, but then Tomita performed a hiza guruma and locked a juji-jime on the ground, making Nakamura pass out. Tomita was hailed by the spectators and heralded as a hero due to his victory. When Kanō Jigorō began to develop judo from jujutsu, his efforts met with opposition from jujutsu practitioners. However, Kano drew a loyal following that included exceptional fighters. Hence the term "Four Guardians of the Kōdōkan" came into existence referring to Tsunejiro Tomita along with Yamashita Yoshitsugu, Yokoyama Sakujiro, and Saigō Shirō. Inspired by Yamashita Yoshitsugu's success in the United States (Yamashita taught judo to President Theodore Roosevelt, among others), the 39-year-old Tomita decided to move to New York City. Like Yamashita, Tomita brought a young assistant with him as an exhibition partner. The young man was Maeda Mitsuyo, 26-year-old judoka who later became fundamental to the development of Brazilian jiu-jitsu. Tomita, Maeda, and Soshihiro Satake arrived in New York City on December 8, 1904, just one year after Yamashita came to the States. February 3, 1905: Tomita and Maeda gave an exhibition at the Harlem branch of the Young Men's Christian Association (YMCA). February 7, 1905: Six hundred spectators in the Columbia University gymnasium watched an exhibition of judo and "two-handed sword fighting" (kendo) by six Japanese experts. According to New-York Daily Tribune, industrialist Edward Henry Harriman brought the experts to America after he became interested in "this type of fighting" on his trip to Asia. Tomita had Maeda rush up to him and take a vicious swing. Tomita would then grab Maeda by the arm or throat and swing him to the mat. February 16, 1905: Tomita and Maeda gave a demonstration "before 1000 Princeton students". Maeda threw N. B. Tooker, a Princeton football player, while Tomita threw Samuel Feagles, the Princeton gymnasium instructor. February 21, 1905: Tomita and Maeda gave a judo demonstration at the United States Military Academy at West Point, New York, where Tomita and Maeda performed kata (patterns)—nage-no, koshiki, ju-no, and so on. At the request of the crowd, Maeda wrestled a cadet and threw him easily. Because Tomita had been the thrower in the kata, the cadets wanted to wrestle him too. Tomita threw the first (Charles Daly) without any trouble. However, Tomita twice failed to throw another football player named Tipton using tomoe-nage (stomach throw). Tomita was much smaller, so the Japanese claimed a moral victory. March 8, 1905: Tomita and Maeda did better at the New York Athletic Club. "Their best throw was a sort of flying cartwheel," said an article in the New York Times, describing Maeda's match with heavyweight (200 pound) wrestler John Naething. "Because of the difference in methods the two men rolled about the mat like schoolboys in a rough-and-tumble fight. After fifteen minutes of wrestling, Maeda secured the first fall. Ultimately, however, Naething was awarded the match by pin fall." July 6, 1905: Tomita and Maeda gave a judo exhibition at the YMCA in Newport, Rhode Island. September 30, 1905: Tomita and Maeda gave a demonstration at another YMCA, in Lockport, New York. In Lockport, the local opponent was Mason Shimer, who wrestled Tomita unsuccessfully. In April 1905, Tomita and Maeda started a judo club in a commercial space at 1947 Broadway in New York. Members of this club included Japanese expatriates, plus a European American woman named Wilma Berger. During his return to Japan in 1910, Tomita visited Seattle. To celebrate his visit, the local judo club known as Seattle Dojo held a judo tournament on October 27, 1910, that was attended by local reporters. Tomita's son, Tomita Tsuneo (富田常雄), was a novelist, best known for his judo novels Sanshiro Sugata (1942) and Yawara (1964–65). ^ Active Interest Media, Inc (January 1962). "KODOKAN". Black Belt. pp. 6–9. Retrieved 2010-08-29. .
^ Linhart, Sepp; Fruhstuck, Sabine (June 1998). The Culture of Japan As Seen Through Its Leisure. State University of New York Press. p. 85. ISBN 0-7914-3791-4. ^ Inoue Shun (May 1, 1998). Stephen Vlastos (ed.). Mirror of Modernity: Invented Traditions of Modern Japan. University of California Press. p. 166. ISBN 0-520-20637-1. ^ a b c Watson, Brian (October 2000). The Father of Judo: A Biography of Jigoro Kano. jp: Kodansha International. p. 197. ISBN 4-7700-2530-0. ^ Judo Memoirs of Jigoro Kano. Trafford Publishing. October 3, 2008. p. 20. ISBN 1-4251-6349-1. Retrieved 6 September 2010. ^ a b c Tomita, Tsunejiro (May 1923). A side view of judo development 4. Kodokan Bunkakai. ^ Takahashi, Masao (May 3, 2005). Mastering Judo. Human Kinetics. p. iv. ISBN 0-7360-5099-X. ^ a b Thomas A. Green; Joseph R. Svinth (2003). "MAEDA MITSUYO: THE COUNT OF COMBAT". Martial Arts in the Modern World. Praeger Publishers. pp. 64–65. ISBN 978-0-275-98153-2. ^ "JIU JITSU AT HARLEM Y. M. C. A." New-York Daily Tribune. Washington, DC. Library of Congress. 3 February 1905. p. 10. Retrieved 5 September 2010. ^ "JUDO FOR SELF-DEFENCE". New-York Daily Tribune. Washington, DC. Library of Congress. 8 February 1906. p. 5. Retrieved 5 September 2010. ^ "JAPANESE WRESTLER THROWS A PRINCETON FOOTBALL MAN". The San Francisco Call. 17 February 1905. Retrieved 10 September 2010. ^ Baltimore Sun, February 18, 1905. ^ Baltimore Sun, February 22, 1905. ^ New York Times, March 9, 1905. ^ "THE GENTLE ART OF JIU-DO". The Sun. The New York Public Library, Astor, Lenox and Tilden Foundation. 26 March 1905. p. 9. Retrieved 5 September 2010. ^ Columbia Spectator, March 22, 1905. ^ "THE GENTLE ART OF JU-DO" (PDF). The New York Times. 6 April 1905. Retrieved 5 September 2010. ^ Newport Herald, July 7, 1905. ^ Lockport Journal, October 7, 1905. ^ New York Times, April 6, 1905. ^ Gregory, O.H. and Tomita, Tsunejiro. Judo: The Modern School of Jiu-Jitsu. (Chicago: O.H. Gregory, no date but about 1906). This page was last edited on 12 March 2019, at 09:59 (UTC).